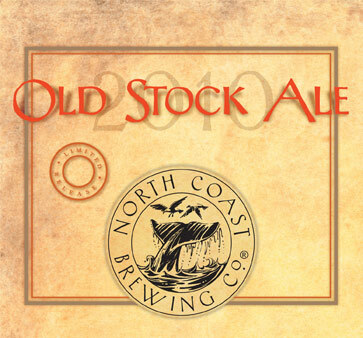 Back in January, I posted a tasting note about North Coast’s 2010 Old Stock Ale that I jotted down during Chanukah–December 2010. Back then, the 2010 Old Stock Ale was new, and damn, was it raw (or “hot” in Alehead-speak). You might have been able to get a buzz just by breathing in the vapors. I wrote that I would try to age the remaining 3 bottles in the 4-pack and let you know what I found. To my own genuine astonishment, I actually left those beers alone for the past 6 months. This past weekend, I cracked open one on Saturday night and one on Sunday night to write this follow-up tasting note. The one I drank Saturday night seemed close to mid-50s (Fahrenheit), and had a tiny amount more foam at the top than the one I drank straight from the fridge on Sunday. Also, for research purposes, on Saturday night I drank a Founders KBS that I’ve been aging since March under similar circumstances. I’ll share my thoughts on the comparison between the two, as well. Overall, aging helped the Old Stock Ale. It was much mellower than when it was fresh. But it was also somewhat less carbonated, which I felt detracted from the beer’s already-low drinkability. APPEARANCE: Maroon. Clearer than I remember it being the first time around. HEAD: At the December tasting, the Old Stock sustained a thin beige head. But this time I could not get it to generate any head whatsoever. Maybe next time I will pour it from up on a stepladder. Or I could try letting it warm up a little more first–the Saturday beer was ever-so-slightly foamier than the Sunday one. NOSE: Rich notes of caramel, dried fruits and maybe roasted nuts (?). None of the fuminess of the December pouring. TASTE: The foremost flavor is caramel, but it is not too sweet. There are plenty of companion tastes, like bread, dried figs, and a little vanilla. As with the aroma, there is much less alcohol burn than before it spent 6 months in my basement. I was impressed with how balanced it was, again, compared with its former self. MOUTHFEEL: This was a little disappointing. In January, I wrote that the Old Stock Ale had an incredible consistency: smooth, but carbonated enough to prevent it from becoming cloying. This time around, it had the mouthfeel of a glass of sherry. It was light-bodied for the style, but so flat that there was very little to break up the strong flavors. DRINKABILITY: I agree with my old self (I always do, since I’m never wrong), but for different reasons than those I stated when the beer was new. Then, it wasn’t drinkable, because it was boozy and just generally unrefined. Now, it’s not drinkable, because the flavors are simply too much. I actually loved every sip that I had on Saturday. But on Sunday — 24 hours later — I could hardly choke down a second one. Today, if I had another, I think I would spill it out after two sips. I stand by my original rating of 3 hops. It’s delicious, but even 6 months in my basement didn’t cure some of the overwhelming elements in this beer. Hopefully I’ll be ready for another by the time the 2011 Old Stock Ale comes out (and sits in my basement for 6+ months again). One interesting aspect of my Old Stock Weekend was the comparison to the Founders KBS I had also been aging. Now, I love KBS–enough to drive about 100 miles to buy up all that I can. At 11.20% ABV, you’d expect the KBS to cellar extremely well. Hell, it spends a year in a cave before it even gets to you. But I think it lost a little something in the few months it’s been in my basement. Initially, Founders 2011 KBS had a bold, coffee-forward taste. The notes of vanilla and bourbon were certainly present, but it had serious gusto–in a good way. I could be mistaken — it is a subtle difference, if any (we are only talking about 3 months in the basement, after all) — but I think the coffee flavors faded a little bit. That may the logical outcome of aging a breakfast stout, but if so, I don’t think it did the beer any good. 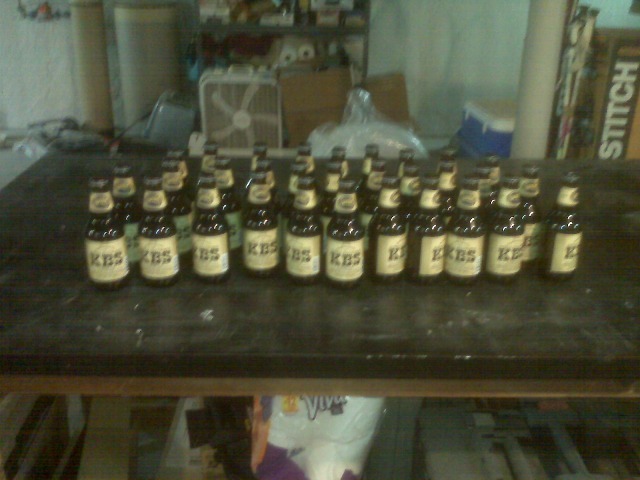 Verdict: age the Old Stock, drink the KBS immediately. Next!! Follow the Commander on Twitter @CdrPOC. Posted in Tasting Notes.Tagged 3 hops, Aging Beer, Founders, Imperial Stout, KBS, North Coast, Old Ale, Old Stock Ale. I shall now leave work early, head home, and drink my remaining KBS. I don’t know about you, but alcohol warmth is always welcome in my old ales, same as Scarlett Johansson is always welcome in my bed. One of those scenarios is decidedly more likely to play out than the other. I was just thinking that there are degrees of alcohol warmth that become excessive and unwanted… I thought the way they phrased it could be considered misleading.